The standard mobile-phone network in Italy and Europe is called GSM. A few American companies (for example AT&T and T-Mobile) use GSM technology; others, including Verizon and Sprint, use a different system, called CDMA, which is not compatible with Italian networks. If you want to use a Verizon or Sprint phone abroad, you must be sure that it is a global phone with GSM capabilities and that your account has been set up with international eligibility. Within the GSM network, different regions operate on different bands. The United States uses two bands, and Italy and most of Europe use two other bands. Only a GSM phone that’s tri-band or quad-band would then work both in Italy and in the U.S. The most popular smartphones all work internationally, including the Apple iPhone series, the Samsung Galaxy series, and the Google Nexus phones. American companies offer international plans to travelers. Check with your company to see the cost of the plans and the charge per minute. They used to be be costly but prices have been decreasing. Prepaid plans with data are relatively cheap in Italy. The most popular and reliable Italian mobile-phone companies are TIM, Vodafone, and Wind. If you go on line you’ll mostly likely find only their regular plans, which require a contract and a monthly payment. But in their stores and in many other stores you’ll be able get a prepaid SIM card (a removable chip that slides into the phone), which will remain active as long as you have credit on it—and if you mostly use it to receive calls instead of making them, you won’t need to recharge it during your stay in Italy. Please note that not all plans automatically include text messaging. Please check with your company to see if your phone brand and model would work with an Italian prepaid SIM card. Most American phones are electronically locked so that one cannot switch SIM cards. But it’s possible to get your phone unlocked (call your company), allowing you to replace the original SIM card with a local Italian SIM. Please note that in most cases the unlocking must be done while in the United States. If necessary you can purchase a GSM unlocked phone or smartphone at Trony, Euronics, Media World (there is one store in Stazione Centrale), or several smaller shops in Milan. 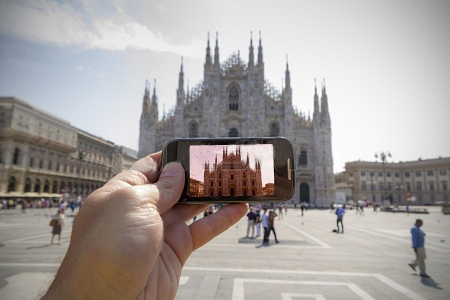 A smartphone is also useful for your course’s final project, which consists of an introduction and a slideshow of photographs that you took during your stay in Italy. Please be aware that calls from Italy to US toll-free numbers may not route, depending on the originating carrier. (In my experience, they never go through). If they do route, then the caller would need to pay international dialing charges, just like for any other call to a US local phone number. If you expect to be calling your bank or another company or institution, ask them to provide an alternate US local number for international calls. By Francesco Erspamer in Know how on January 6, 2014 .